Opt in for a Professional Office Relocation in London! It’s a Smart Business Move! We prefer to send an experienced surveyor to assess the size of any commercial moving job. The survey is absolutely free of charge if you are located within the M25 zone. The operative will discuss with you the logistics of your business relocation and explain all the whats and hows that the business removals process may involve. Soon after, you will receive a free quote with no obligation to commit either over the phone or via email. To confirm your interest in our removals company and book a service for a day of your convenience, contact our customer care team 24/7. You will need to arrange a valid parking spot prior to moving day. Office moving and other commercial moves often require the use of more than one van, so it’s best if you contact your Council to help you with the parking. Upon arrival, the technicians will pack your movable property, from office furniture to IT equipment (if you've combined the service with our packing solutions) and will load and secure everything properly into the vans. Note that only a few business clients choose to do the packing themselves. Mind that your items will be insured during the move only if our movers do the packing. 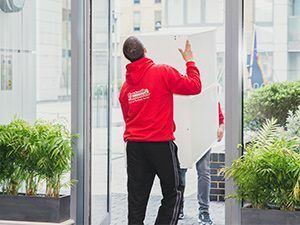 Whether you are moving offices across boroughs in London or your business is relocating to a different city in the UK, Fantastic Removals is always at your service. Your goods, equipment and furniture will be transported with care to the delivery destination so that your stuff arrives intact. The experienced movers will take the most direct route to the new address by using their modern GPS systems. Also, you will be eligible for some nice discounts if you book multiple removals services (ex: several of your employees are relocating, too). We will do our best to personalise our moving solutions to save you time, money and hassle. At the delivery location, the Fantastic pros will park near the property, assuming that you’ve provided them with a valid parking spot. They will unload and place each item and box on your new premises. The diligent technicians will follow closely your instructions and position every piece of furniture or equipment where you want them to. Upon request, they can help you unpack, as well as assemble items that have been dismantled prior to loading. Should you need any further assistance with your commercial relocation, you can contact our office and we’ll be happy to help. Whether you require an overnight move, storage for your work equipment, or even packing and box delivery services, Fantastic Removals is here to help you. We offer easy to schedule commercial removals services performed by dedicated specialists. We can complete small office removals or more complicated business relocation services, depending on your needs. When it comes to relocating your office, safety is the most important aspect. You don’t have to worry about your removals experience with Fantastic Removals. No matter if you are moving your business from one town to another or want to book our international removals, your belongings are in the safe hands of the removal specialists who have public liability insurance. When Fantastic Removals relocates your personal belongings, it’s done with only well-maintained and regularly serviced vehicles. The removalists drive Transit and Luton vans, equipped with tail lifts for smooth and safe loading and unloading. Also, the technicians work with trolleys, ropes, and removal blankets, so you don’t have to worry about the safety of your items. If you happen to need our removals services for a bigger commercial property, we have a video survey option. Through this information we can accurately calculate the price for your service. You will just have to show us via the camera on your mobile device all your belongings in all the premises. The survey may be scheduled for the most appropriate time and date for you. Fantastic Services now offers you a way to save 10% on over 25 services for an entire year. To take advantage of this discount and of member-only booking slots, simply add the annual membership fee the next time you are booking removals or another service. Your office relocation can be completed outside business hours to ensure that it’s done with a minimum disruption of your daily operations. This means that you can request a weekend, a public-holiday or an overnight office furniture removal service with us so that your IT equipment and office furniture are transported, unloaded and ready for use in time for the next working day. Skilled and trained office movers will do the job, ensuring a smooth office relocation in London. Fantastic Removals also provides internal moves in Greater London, within the perimeter of M25. Whether you require a partial move between different departments, an entire call centre unit shifted to another floor or you are simply expanding and need to furnish a new office, we can help. The removals pros will move the furniture, IT and office presentation equipment carefully to the designated space and position them following your specific instructions. Make the first steps by going through our professional moving checklist. Not all commercial relocations can be planned with a tight and clear schedule in mind. So, customers who need to vacate their premises and wait until their new office becomes available can take advantage of our short- or long-term storage options. The business storage facilities provide security for your items, equipment and goods through 24/7 CCTV surveillance and monitoring. We also offer refunds if circumstances change and you need to collect your belongings earlier than preempted. The minimum storage space rental period is one week. We relocate businesses from various industry sectors, including warehouses, libraries, food service facilities and retail spaces. Our commercial moving company also specialises in fine art and antique removals solutions where valuable items and artefacts will be packed, handled, transported and unloaded with extra care and under full insurance. So, whether you run an art dealers business, own a gallery or manage a museum, we can help you should you need to relocate. Make sure to inform the whole staff, including the distant workers, of the move at least 1 or 2 months before the move. They need time to prepare for this step as well as to take care of their personal desks. Make an inside survey on what the staff doesn't like in the current office and want to be changed at the new one. Use the information to craft the interior design plan for the new office environment before it gets too late. Notify customers and business clients of your move. Send email notifications at least 1 month in advance before changing your address. This way you will avoid business clients and customers coming to your old address, you will also receive mail from them at the right place. Leave this work for the last day at the office in order not to disrupt the working environment. When the work day is over, shut down all hardware and carefully label all wiring and other components for easier unpacking afterwards. Q: Can you move very heavy items? A: Yes. We can move heavy furniture and equipment that weigh up to 80 kg. Anything heavier will require dismantling which means the job will take longer to complete. Mind that this might affect your moving costs. Q: What are the things that you don’t move? A: We do not move any building and hazardous materials, as well as pets. Also, when it comes to commercial moves, we do not move company servers. Q: Do you relocate offices to London from other locations? A: Yes. Presently, we serve residential and commercial clients, located in Manchester and Liverpool, who wish to be relocated anywhere in the UK, including London. Q: Can I purchase any packing material from you? A: Yes. We can supply you with quality boxes, insulation material and labels prior to moving day. Q: What is the insurance for commercial moves? A: Currently, the standards “goods in transit” insurances applies and it is up to £25 thousand. However, higher insurance can be arranged if you specify in advance. Q: How far in advance prior to moving day do I need to schedule a survey? A: We are flexible and you can order your survey appointment pretty close to moving day if your relocation is within the UK. Just check our availability and book online or over the phone. Q: Do you provide storage options for a day or two? A: No. The storage rental period, we offer, cannot be less than 7 days. Q: I only need to move several pieces of equipment to one of our branches. Can you do this? A: Yes. We can provide you with our commercial removals assistance, regardless of the size of the job or the volume of your load.